My house. Ahhhh....I love it - even though it brought me to tears yesterday. My kitchen had a leak in the ceiling, so being the responsible home owner that I am, my dad and I are fixing it. We had to pull down a square in the ceiling to get at the pipes...only to discover that the wood in the plaster had rotted through. This is clearly not a new leak. We ended up having to take down the entire ceiling. 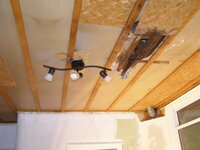 Now I am going to fix the plumbing, shore it up and then drywall. Have I mentioned that we already stripped the walls in there? And to think it all started with a simple paint job to cover the lime green. stupid vanity. In other news I caught 3 mice today. Peanut Butter is good. Cleaning mousetraps is gross. I came home and found a that a garden elf has been working away. My front yard looks great AND I was treated to a wonderful chalk drawing on the sidewalk by one of my favourite boys. Thanks! After the nastiness of yesterday's ceiling discovery and the tails that are inhabiting my home, it was so nice to see beauty. hey! i helped to paint that vanity ... does that make this my fault!? kidding ... sorry jen! all this work will make the house even MORE special when it all comes together. ask for help ANY time!! i'm scared of garden elves ... but i do like sidewalk chalk!! If I can do anything please let me know! I have more straws for you to add to your housewarming present but these ones are in a straw holder!